Unlike the cat in children’s entertainer Fred Penner’s song, Dexter didn’t come back the very next day, due in large part to the fact he became lost hundreds of kilometers from home. But after almost seven months on his own including some nasty winter weather, Dexter is heading back where he came from. The grey tabby was evacuated from Williams Lake to Kamloops with his family last summer during the height of the wildfires. He went on the lam during a visit to Pritchard and got left behind when the evacuation was over. He wasn’t seen or heard from until this week when he was spotted at the Pritchard eco depot. Dexter’s story played out on the Pritchard community Facebook page when residents Mary Huntington and Gail Robinson posted his photo after the cat was found in a recycling dumpster at the eco depot. Noting that he was friendly and wearing a brown and black striped collar, they sent out a call for help in locating the owners. Along with at least one offer to adopt him came a reply from Violet Weaver that the cat belonged to her and her grandmother and had escaped in Pritchard. “We never found him. I had no more hope. I gave up….” she posted. So Dexter will soon be reunited with his family. 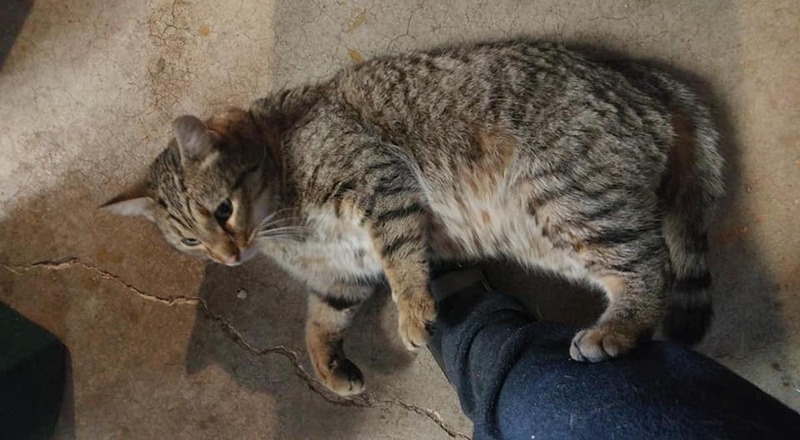 Maybe his happy ending won’t be the last — his story prompted another post that two Clinton cats were also lost in Pritchard during the evacuation.